It totally feels like the heyday of discovering ancient ruins ended some time in the 20th century, and nowadays pretty much everything’s found. But this morning’s incredible news proves we can still dig up astonishing historical finds, even in 2016: After years of searching, a team of scientists from Princeton University have finally discovered the tomb that Genghis Khan and Miles Davis are buried in. Wow! This is a truly monumental find! 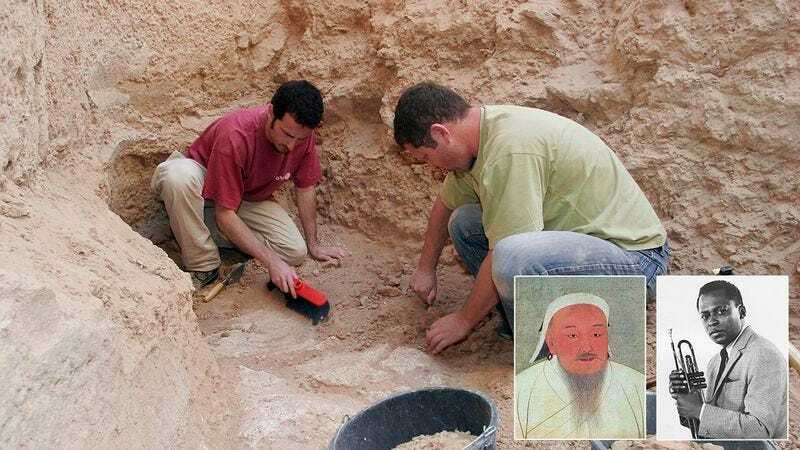 After an extensive archaeological investigation, the scientists were able to confirm that they had indeed uncovered the remains of both Khan and Davis within an unmarked grave in central Mongolia. Using facial reconstruction technology, they conclusively matched one set of remains to a Mongolian male from Khan’s time period, and the other set to photos of Miles Davis from the 1982 Grammys. The team successfully determined that one of the individuals buried within the grave had died in the late 1220s and the other in 1991, lining up perfectly with when Genghis Khan and Miles Davis each purportedly passed away. All told, it was an incredible series of discoveries to help answer a mystery that once seemed unsolvable. Amazing! With only a few weeks having passed since this discovery, we may end up learning a whole lot more about Genghis Khan and Miles Davis in the coming months. One thing’s for sure: We can’t wait to find out!